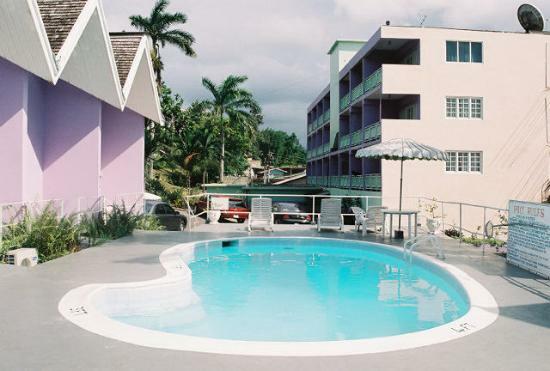 ""The Wexford Hotel, marketed as """"The Wexford,"""" is ideally located on Gloucester Ave., Montego Bay, now more popularly known as the """"Hip Strip."""" The hotel overlooks the ocean and the only park on the strip. It is just a five-minute walk to the world famous Doctors Cave Beach to the right and the Aquasol Beach to the left. The hotel is surrounded by eight restaurants and five nightclubs including Margueritaville and Coral Cliff Casino and Gaming Lounge. <BR><BR> Our restaurant, The Wexford Grill, offers Jamaican and International cuisine with fine dining facilities in air-conditioned comfort on the front terrace overlooking the park and Caribbean Sea. The Wexford has 60 rooms each with air-conditioning, direct dial telephone, cable TV, private balcony and safety deposit box.